BEDFORD-STUYVESANT, Brooklyn (WABC) -- New charges have been filed in the death of a construction worker who was killed in a 2015 wall collapse at a site in Brooklyn. Now, the owner of the construction company that employed the victim -- 19-year-old Fernando Vanegaz -- is charged with manslaughter, criminally negligent homicide and other offenses. The defendants were identified as 47-year-old Michael Weiss and his companies RSBY NY Builders Inc. and Park Ave Builders Inc. 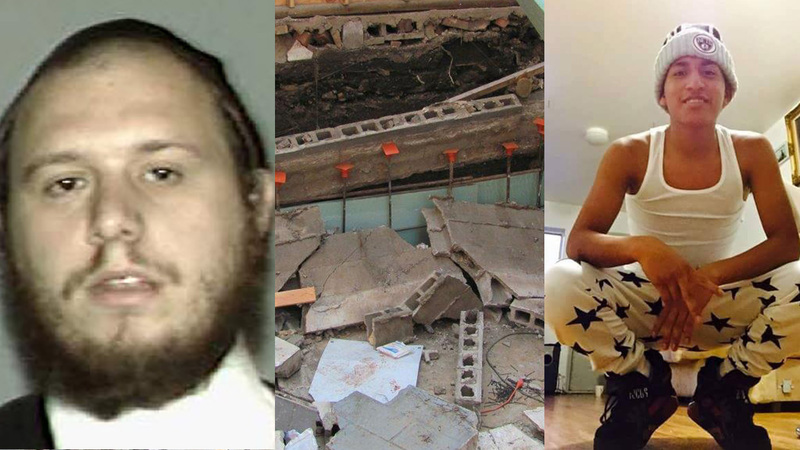 Prosecutors say Weiss' employees were working at a construction site on Myrtle Avenue in Bedford-Stuyvesant on September 3, 2014, replacing a one-story building with a five-story building, when Weiss ordered several of his employees to excavate in the rear of the lot in an area not permitted by the approved Department of Buildings plans and without knowledge of other professionals involved in the project. It is also alleged that despite repeated requests from workers in the months and even hours leading up to the collapse, Weiss refused to provide any material for shoring or underpinning of the excavation and adjacent exposed walls, despite OSHA regulations requiring him to do so. Authorities say he also refused to listen to the safety concerns of his workers, insisting they continue working in an unsafe area. At approximately 11:30 a.m., the wall of the adjacent building collapsed, and masonry blocks and other debris fell on three of the workers. Vanegaz suffered severe head trauma, lacerations to his head, broken legs and cardiac arrest and was pronounced dead at the scene. Acting District Attorney Gonzalez said, "Fernando Vanegaz should be alive today," acting District Attorney Eric Gonzalez said. "Construction site deaths such as his are becoming all too common as builders ignore safety protocols and hire untrained workers to maximize profits." A second worker suffered a fracture of the lumbar vertebra, a fractured hip and injury to his spine. He has undergone multiple surgeries and continues to have difficulty walking or engaging in physical activity. A third worker also suffered a lumbar vertebra fracture, a fractured nose and skull and orbital area, a crushed face and scalp, a fractured rib and other facial bone fractures. He had back surgery and continues to have difficulty with physical activity and suffers constant back pain. Weiss is charged with second-degree manslaughter, criminally negligent homicide, second-degree reckless endangerment, third-degree assault, third-degree grand larceny, fourth-degree criminal tax fraud, first-degree falsifying business records, offering a false instrument for filing, fraudulent practices under the workers' compensation law, and failing to secure workers' compensation insurance. An indicted co-conspirator is charged with two counts of second-degree reckless endangerment and will be arraigned at a later date. He pleaded not guilty and was released on $100,000, and he faces up to 15 years in prison if convicted of the top count. He is due in court on August 9.